With the technology rapidly evolving, it’s now even more important for the IT companies to step up their game. Cloud computing; thanks to ample of benefits it has offered, has been something that enterprises are driving towards in drove. Among the wealth of cloud computing services and infrastructure in the market, it might get a bit confusing what to opt for. For many businesses, the right answer might lie in the versatile, scalable OpenStack. OpenStack is a combination of open source tools (also known as projects) that use pooled virtual resources to build and manage private, hybrid and public clouds, all of which can be highly customized per customer’s business needs. OpenStack is one the leading open source option for building the private cloud environment. Private cloud distributions run on OpenStack are far better than those DIY approaches. Although public cloud has been around longer, but adoption of private cloud is on the constant rise. That’s because many enterprises are now realizing that the private cloud provide a more stable solution for their security concerns by dedicating exclusive hardware to each user. Instead of their data being stored off “in the cloud”, one can point to a group of servers in a data center and say that is exclusively our data on those servers, thus alleviating security issues. It is a solution that can bring important benefits like improved uptime and reliability at a lower cost than on traditional IT infrastructure. One private cloud solution that is gaining wide interest is OpenStack, which has become a de facto standard for open-source based private clouds. As per the current OpenStack User Survey, the share of OpenStack deployments in production is 20% greater than a year ago, with 71% of clouds in production or full operational use. In addition, the latest survey showed that 72% of surveyed said their number one business driver for deploying OpenStack was to save money over alternative infrastructure choices. Several companies have already proven out the return on investment that OpenStack can provide for their businesses. In public cloud, the cost is usually optimized by the developing work that has a lifespan of months at max. This sort of environment might be suitable for companies that have not much workload and may need to be scaled up and down as per the demand of workload. For companies that have an escalating workload to cater and have sensitive data to deal with, then private cloud is the solution that works best for such companies. Moreover, many companies on public cloud usually find themselves paying more for high traffic workloads. Hence when it comes to network bandwidth intensive workload then in the long run it’s the private cloud that saves money for enterprises. Public cloud focus strategies are usually limited when it comes to flexibility. With OpenStack private cloud, many companies can achieve the level to flexibility they’re looking for to manage their workload. In future, it is expected that many companies will opt for multiple cloud scenarios to manage their data; in that case seamless transaction of data from one cloud to another will be very important. The public cloud limits interoperability with other clouds and hence lacks the ability to move away from certain public cloud offerings, as workload demands change. This can be easily solved with the private cloud, as applications and data can be moved from one cloud environment to another. For enterprises, all around the globe, security is understandably a foremost concern. In OpenStack private cloud, company-specific and role-based access controls can be created easily. For companies where security policies are critical to their business, private cloud works for their advantage. Private cloud lets users customize their security policies according to the individual needs of their respective business. This lets organizations to protect their intellectual property and sensitive data. In all, OpenStack give enterprises an option to quickly and easily deploy their cloud systems, introduce new services and respond to changing market conditions. While the private cloud may not be for everyone but a managed data center operator can make the transition to private cloud computing an affordable process and enable your company to fully experience all of the great benefits of the private cloud. If you’re looking for reliable OpenStack private cloud solution for your enterprise then you might want to checkout our private cloud solutions. 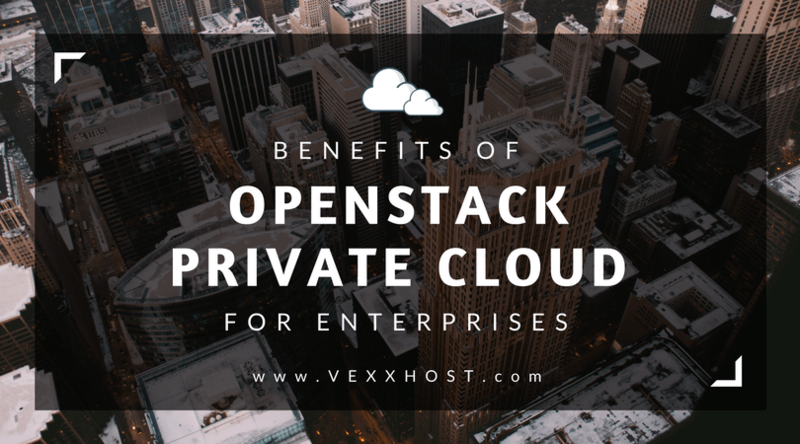 At VEXXHOST, a team of OpenStack and cloud computing experts are available to help you in understanding the advantages and perks of private cloud computing and how it can be best utilized for your business.